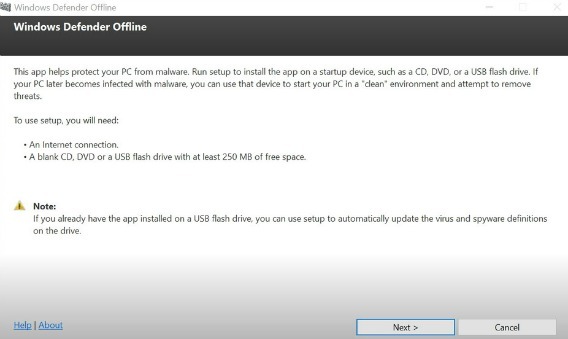 To get started, Windows user need USB flash drive at least 1GB of capacity, or blank CD/DVD, or create an ISO image. To check version of Windows 10 running on PC, using the Windows Key + I keyboard shortcut to open the Settings app, go to System > About, at here user should found the version of Windows 10 under “System type”. Note: Make sure back up all relate content. Once downloaded, double-click the mssstool32.exe or mssstool64.exe depending on Windows version to open the wizard. Once open, click Next to continue and accept the license agreement. 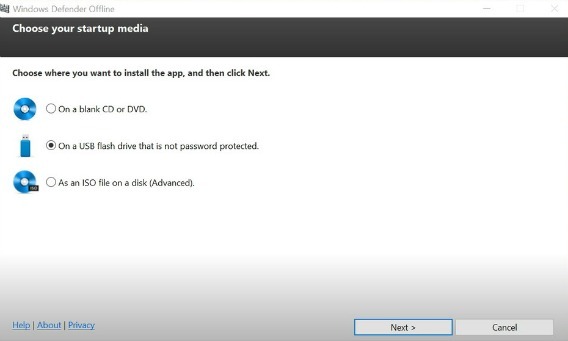 Select the type of bootable media (On a USB flash drive that is not password protected), and then click Next. After done, click Next to confirm and then the wizard will reformat the USB flash drive. Windows Defender Offline will update the virus and spyware definitions, and create the Windows Defender Offline bootable media. Once completed, simply click Finish button to close the wizard. Now, Windows user need to configured PC to boot from removable media. Just simply hit one of the keyboard’s function keys (F1, F2, F3, F10, or F12), ESC, or the Delete key during PC boot to access the BIOS and change the boot order. For Windows 10 PC, just go to Settings > Update & recovery > Recovery under Advanced startup, click Restart now. Next, in the boot menu, click Troubleshoot > Advanced Options > UEFI Firmware Settings > Restart. The PC will then boot into its BIOS where can change the boot order. Last, connect the removable media on the PC and then restart PC. The Windows Defender Offline will automatically start perform a full PC scan. Note: Windows Defender Offline not only works for Windows 10, it also can use for Windows 7, Windows 8, and Windows 8.1 operating system.